A number of years ago, during the stag party celebrations for a good friend of mine, I went along to play paintballing. Upon arrival at the centre we discovered that our opponents for the day were a group of men who had evidently been paintballing on several occasions before; they had the correct footwear, warrior-like nicknames for each other, and most worryingly of all: their own guns. They were likely to be more than a match for our disorganised and hungover group of musicians, liberals and wimps. And so it proved. I was ‘killed’ within 30 seconds of the first game starting, taking a pellet direct to the facemask. My colleagues fared no better. With a mouth full of yellow paint I watched as my buddies died face down in the mud. War is hell. After three or four games during which we had our arses repeatedly handed to us the safety official accompanying us around the course became exasperated. “Have any of you ever done this before?”, he asked. A single arm was raised, belonging to Richard Loach. Rich was immediately given the job of captain, which he accepted with some reluctance. He began tentatively, dividing the team into attack and defence squads and muttering something or other about tactics. Soon, however, he began warming to the task and eventually grew visibly before our eyes when he started shouting motivational phrases in a highly animated manner, evoking the spirit of Ron Saunders himself. It was stirring stuff, believe me. As Rich’s speech neared its Henry V climax, and at the very point that we started to believe in ourselves, he shot himself in the foot. Literally. A split second later the hooter honked for the beginning of the next game and the enemy came over the brow of a hill—finding us collapsed in a heap of weeping laughter. They fired at will. This moment of pure slapstick will live with me forever and a day, and it just so happens that Richard was merely carrying on what is a long Brummie tradition. Without Birmingham, folks, there would be no slapstick comedy. It really originated with Charlie Hall, who was born in Birmingham in 1899. As a young man he trained as a carpenter before finding his way to Hollywood, via a sister in New York. Working as a stagehand, he became friendly with a young Stan Laurel and eventually appeared in over 40 movies with Stan and his partner in LOLs, Oliver Hardy. 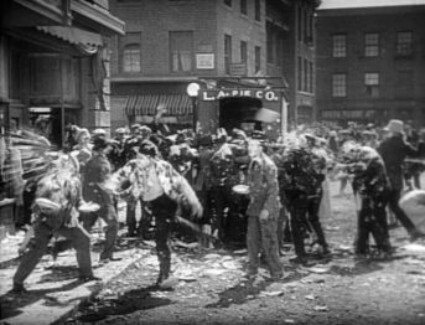 During one such film, The Battle of the Century, Laurel and Hardy are caught in the middle of a gigantic custard pie fight. By throwing the first of 3000 pies, this fight was started by none other than Charlie Hall. A Wetherpsoons, in his home district of Erdington, is a fitting tribute to a man: where comedy fights are often only a spilt pint away. Without Birmingham there would be no You’ve Been Framed. Think about that. As a footnote it is worth mentioning that every child who grew up in Birmingham in the late 1970s and early 1980s went to school with a kid who claimed that his dad was the Phantom Flan Flinger from Tiswas. May the circle be unbroken, bab.